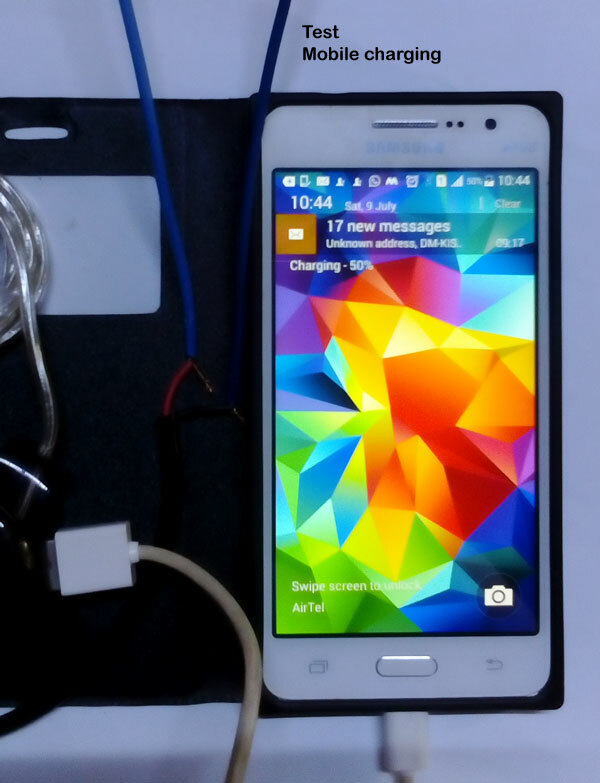 Why wasting electricity for charging USB devices including Mobile phone? Sun is there to give power for this. 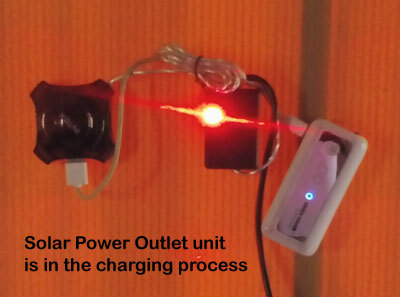 Install a Solar Power Outlet in your home to harvest solar power for charging all USB devices in day time. 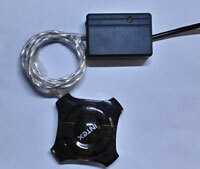 Its cost is only Rs.500 and you get unlimited day power for more than 25 years to charge all USB devices. The expensive part of the project is Solar Panel. 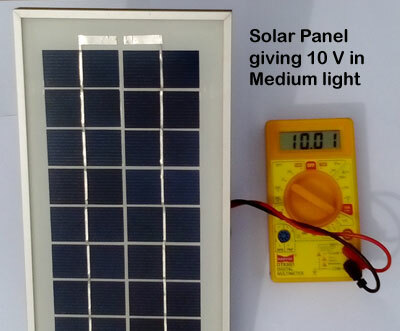 A 12 Volt 5 watts Solar panel costs around Rs.400 because the current rate is around Rs.80 per watt. The remaining components costs only Rs.100. So by spending Rs.500 initially, you can charge all your USB devices at the expense of only 6 Paisa per day . The calculation is for 25 years (50,000 Paisa / 9000 days = 5.5 Paisa). So hurry up to make this project. 8. 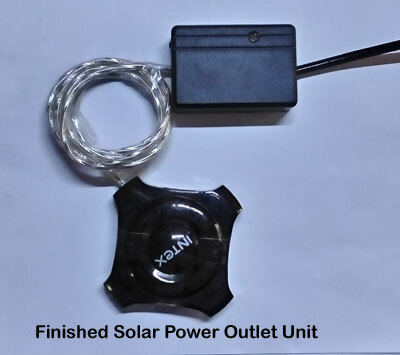 Shield cable to connect Solar panel- As per your requirement. Let us start the project. Before that, know something about the solar panel. The Solar panel is an array of Solar cells. When the Photons of sunlight hit the semiconductor of solar cells, they generate current based on the intensity of light. As a general rule, for each watt power of solar panel, there will be around 80 mA current in bright sun light. So a 12V 5Watt Solar panel gives around 400 mA current. (5 W / 12V = .416 A or 416 mA). 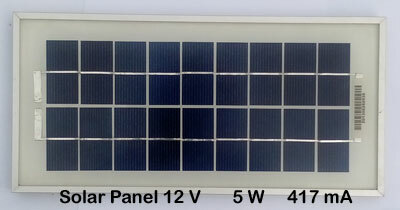 A 10 Watt panel gives around 800 mA current. This is only an average value because, the sunlight intensity is not steady always. Any way, we can expect 200 mA to 400 mA current from a 5 Watt Solar panel. 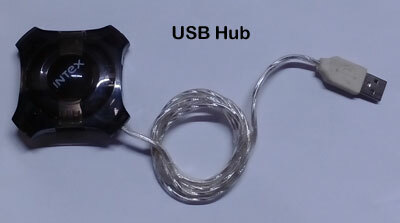 This is sufficient for charging all USB devices because, the USB 2.0 port of Computer and Laptop is giving only 200 mA current. It consists of a voltage regulator IC LM 7805 to regulate the input voltage from the solar panel to 5V for charging the devices. 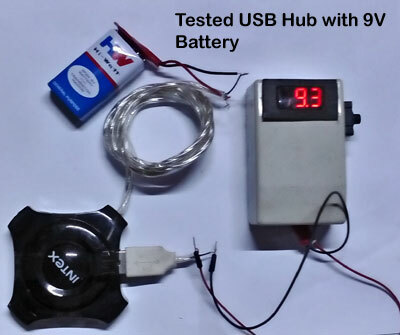 Most of the Lithium Ion batteries present in USB devices including Mobile phone is rated 3.6V. 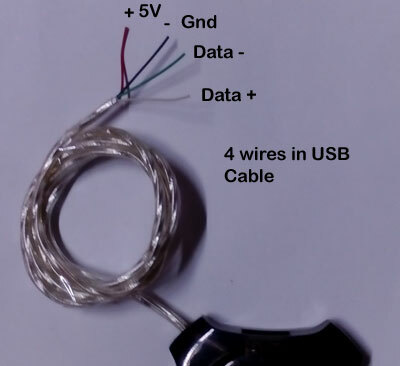 So the regulator will give 4.3 – 4.8 V output for charging the 3.6V battery. 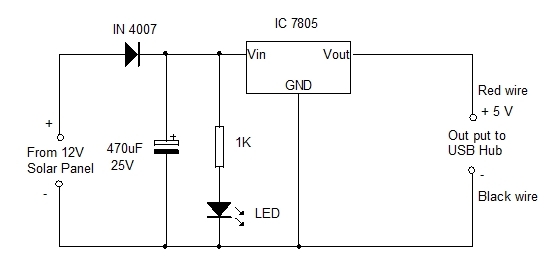 IC 7805 will not give exact 5V output, since there will be some voltage drop in the IC itself. 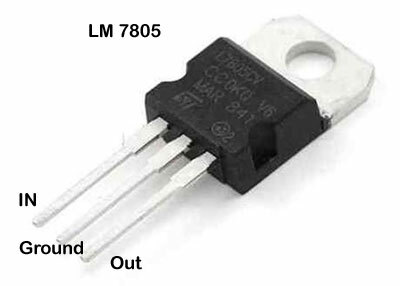 IC 7805 can handle up to 800 mA current, so no heat sink is required for this circuit. If you add one, it will be good. 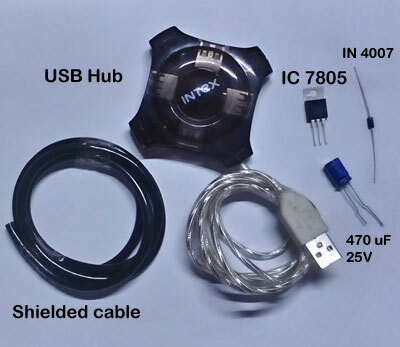 IC 7805 is a three pin device and its first pin is input, second pin is ground and the third pin output. 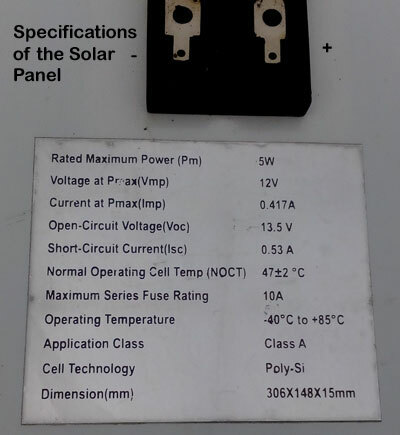 Since the Solar panel is generating DC, it can be directly connected to the voltage regulator. 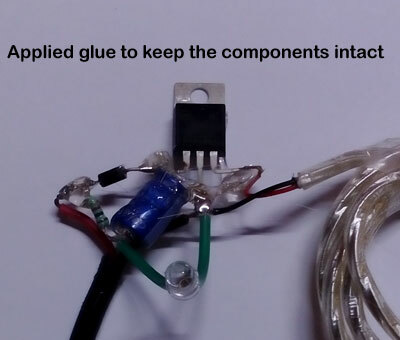 But IN4007 diode is added in the circuit, to prevent the back ward flow of current to the solar panel. The 470 uF capacitor act as a Buffer so that, slight voltage fluctuations in the input will not affect the working of regulator IC. The LED with the 1K Resistor simply acts as an indicator to show the presence of solar power in the circuit. Its brightness varies depending on the input power. 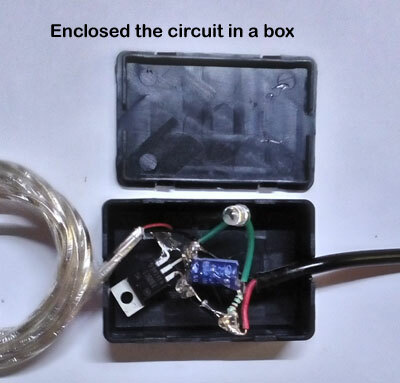 Connect the Solar panel to the input of the circuit with correct polarity. + and – markings are there is the connector pins of solar panel. 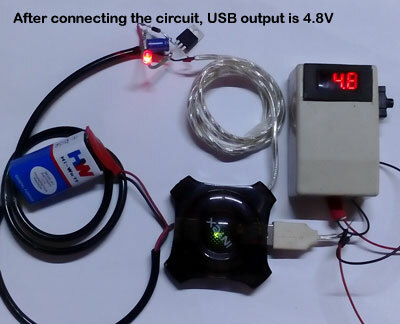 Connect the output from the voltage regulator to the Red and Black wires of the USB Hub with correct polarity. 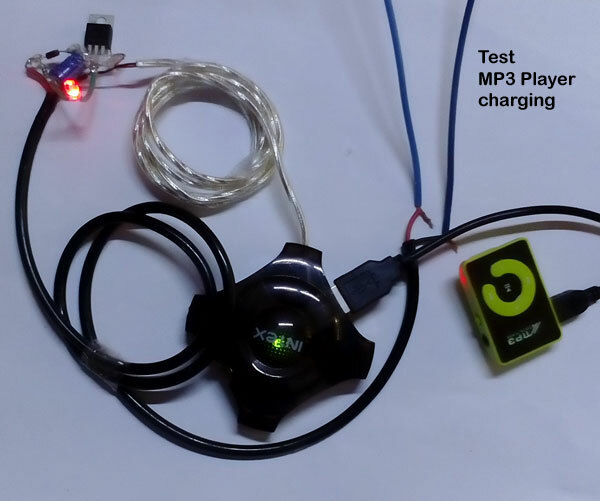 So if more than 6 Volt is available from the solar panel, the circuit gives 4.3- 4.8 V output to the USB Hub. You can connect all the USB devices to the USB Hub for charging. 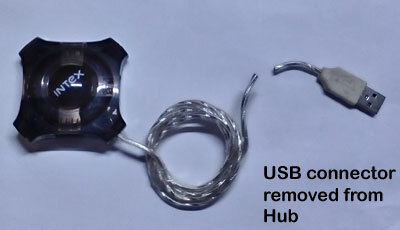 It is important to note that, there is “Current sharing” in the USB port. So it is better to connect maximum 2 devices at a time. 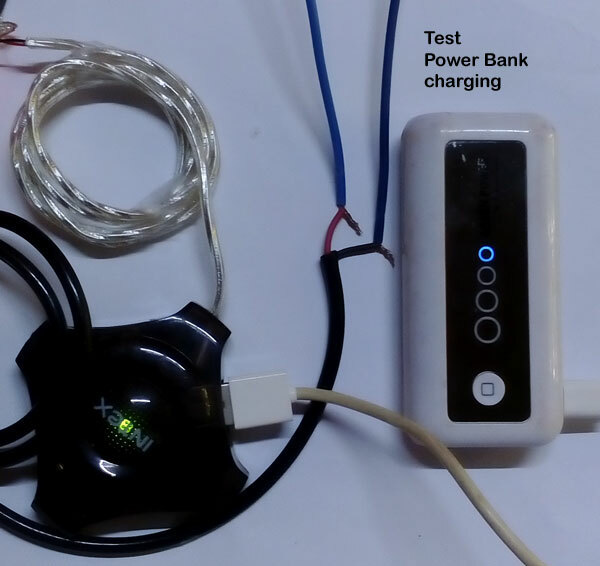 Since the charging current is lower than the Mobile charger, the charging process will be slow. But the slow charging is ideal for the battery. 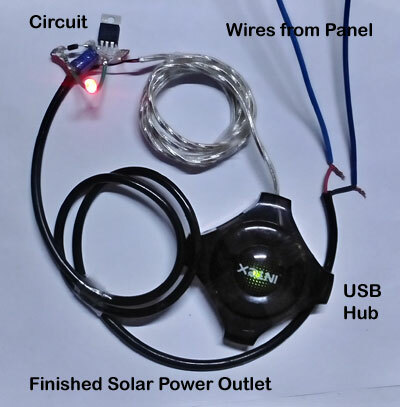 See the following images to learn the step wise method to make the Solar Power Outlet.